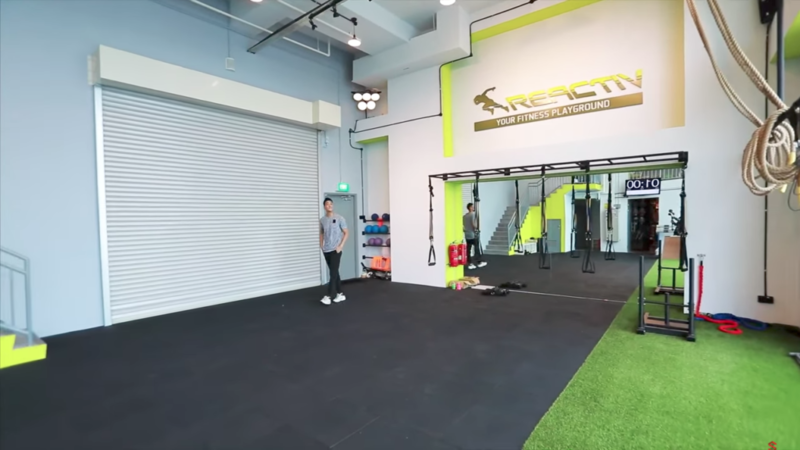 Home SuperSeed Originals BrosTalk with Andee C. Fitness Playground at REACTIV | BrosTalk with Andee C.
In this first ever episode of BrosTalk, host Andee Chua takes us to Reactiv, where we meet its multi-talented founder – singer, sprinter, radio deejay, and fitness coach, Alfred Sim! Left-Right: Alfred Sim, Artiste, Coach, Founder of Reactiv; Host Andee Chua. Dubbed the Fitness Playground, Reactiv aims to make fitness fun and effective through their thematic fitness programs! They believe in a Back-to-Basics way of training your body, and helping you become faster, stronger, and healthier. The premises of Reactiv at Victory Centre. Reactiv offers short- to mid-term fitness programs, tailored for people of various fitness levels. They also have more intensive speed-training programs, aimed at helping professional athletes achieve peak physical condition. Reactiv: Workouts You Can Try! In this episode, Alfred demonstrates several workouts that can train your speed, agility, and strength. With fairly minimal equipment, you too can incorporate these workouts into your routines! Alfred’s version of Push Ups uses a medicine ball to add some instability. Some of the workouts are not all that unfamiliar, but Alfred adds a twist on it for more effectiveness. For example, Alfred recommends incorporating a medicine ball into your push up routine. This adds an element of instability, which helps hone your balance and agility, while training your upper body strength. Take the Plank a step further with the use of a Swiss ball. Planking is a great way to train your core muscles. By just using a Swiss ball, you can get more core strength training out of the same exercise! After the demonstrations, Andee and Alfred challenge each other in a friendly competition! Who will come out tops, and who will be left wheezing at the end of just 6 minutes? I’d hate to spoil the ending for you, but remember: Andee’s going up against someone who’s an athletics coach AND former National sprinter! All we can say is good luck to you, Andee! Love exercise and fitness? Here’s another great BrosTalk episode you should check out: Buddy Workouts to Try With a Friend!